Over-regulation and human talent have emerged as the top concerns for the Singapore insurance industry in a new survey. The latest Insurance Banana Skins report by the Centre for the Study of Financial Innovation (CSFI) and PricewaterhouseCoopers (PwC) said the top two risks in Singapore were followed by concerns about natural catastrophes and cyber risk. Conducted in March and April, the survey polled 806 insurance practitioners and observers from 54 nations to find out where they saw the greatest risks over the next two to three years. Singapore elicited 22 responses in the fifth such survey since 2007. Globally, too much regulation was seen as the overall top risk for the third straight year. There is widespread concern that the volume of regulation is swamping the industry with costs and compliance problems. This could distract management from running healthy businesses at a time when the industry faces structural change. Having the right team to manage and grow your business will become a real differentiator. PwC Singapore's financial services leader, Mr Antony Eldridge, said the latest wave of regulatory change is creating "huge operational disruption". He said: "Costs, prices and returns could soon become unsustainable if the changes aren't managed effectively." A respondent from Singapore warned that over-regulation "potentially strangles perfectly good and sound insurers from conducting good and sound business", noting that Singapore's regulatory environment is "most onerous" by some measures. On the challenge of attracting and retaining human talent, Mr Billy Bennett, PwC Singapore's insurance leader, said that it has become more acute in Singapore. "Having the right team to manage and grow your business will become a real differentiator," he said. A Singapore respondent warned that a lack of experienced staff would lead to an overall reduction in the quality of underwriting and protection both at the direct and reinsurance level. Taking second and third spots among concerns globally were the macro economy and interest rates. They were followed by cyber risk, which was ranked fourth among the concerns of survey respondents both globally and in Singapore. CSFI director Andrew Hilton said the chief concern is the vast quantity of data held in the "cloud". As such, major breaches are inevitable and will cause financial and reputational damage, he said. Also, market anxiety - as measured by the Banana Skins Index - is at a record high globally despite the improving situation worldwide. Survey editor David Lascelles attributed the negative sentiment to challenges in the growth of regulation, a difficult operating environment and the threat of structural change. 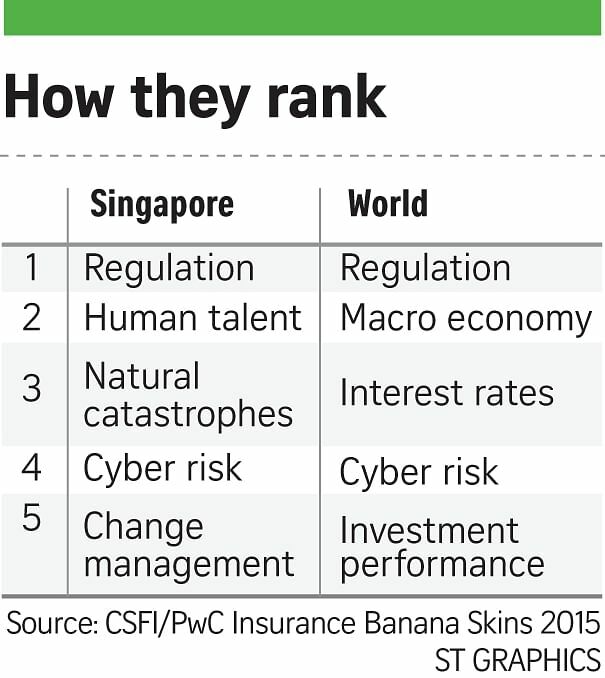 On a brighter note, Singapore's score in the Banana Skins Index reflected a lower level of risk anxiety. Once ranked as among the top risks facing the insurance industry, the quality of management and corporate governance have improved since the last survey in 2013.